Sorry we have been so quiet recently: I was buried under a pile of prospective properties and have only just dug my way out! 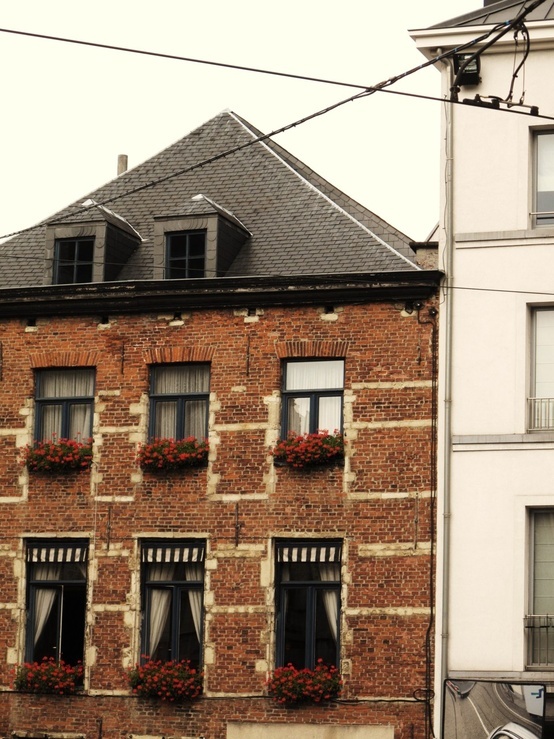 Buying a house second time round is so much more complicated. I only want to think about pretty antique furniture and pastel paints; stop throwing all this boring information at me! I’m sure I’ll get my head around it all soon and I promise I will get back to posting beautiful and hopefully useful things for all you lovely people. 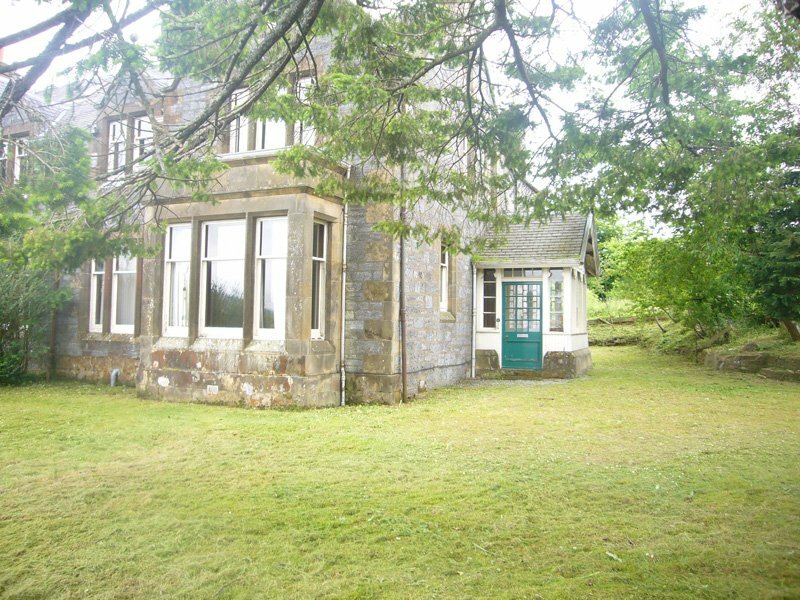 We do have another property in mind at the moment, but I don’t want to jinx it so I won’t be posting about that yet. For now you will have to make do with this pretty picture courtesy of Pinterest. I’m working on a longer post for this weekend at the moment and it’s going to be a good one, if I do say so myself, so please pop by and bring cake! In exactly 24 hours time we will be going to look at the house! I am far too excited to even think in coherent sentences never mind write in them so here is a pretty picture for you to look at instead. My apologies for the teeny tiny post; normal service will be resumed when I stop bouncing off the walls. How To Store Your Children! Now I’m not actually suggesting you find a spare cupboard for your little one to curl up in at night…or am I? No, definitely not. At least not in a scary call social services sort of way. But finding enough room for your children and all the stuff they seem to accumulate (I think the toys in our home have actually started breeding.) is a problem a lot of people have. Childrens possessions are not easy to accommodate, especially modern toys. They are such awkward shapes! Bad enough when you’re trying to wrap these sadistic little parcels at 2am on Christmas Day, but a million times worse over the following years when you have to try to keep them somewhere tidily *and* make sure they are also easily accessible. So what is the answer? 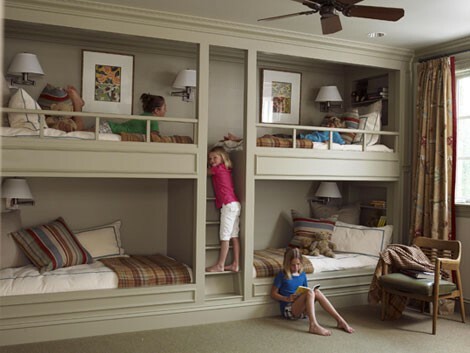 A lot of people turn to bunk beds and I must admit I usually don’t see the need to look any further. 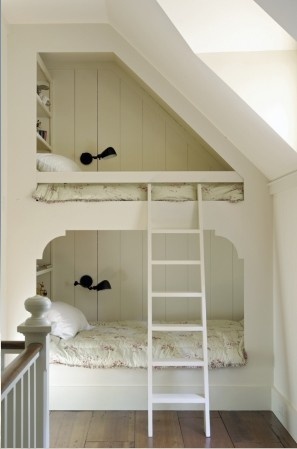 Two children and two single beds in one room rarely leaves much room for anything else. An extra bed with no loss of floor space you say? Awesome! Where do I sign? 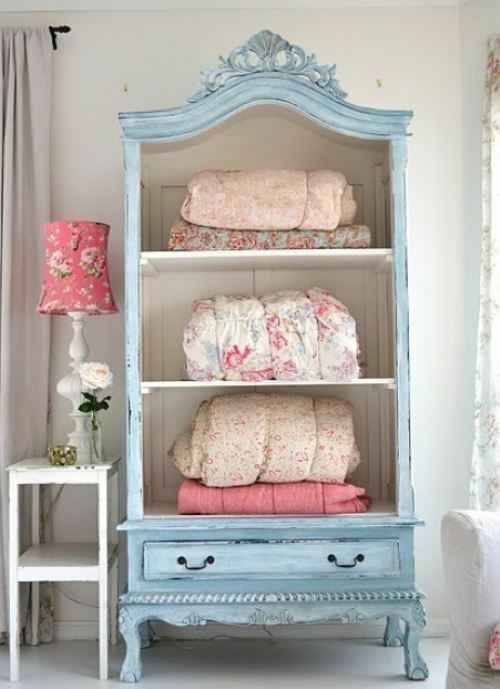 There are so many options when it comes to storing your most precious possession that, with a little research, you should definitely be able to find the one for your childrens bedrooms. Now I know this room isn’t exactly short on space, but when you picture what it would look like with four normal beds in there you must see why the bunk bed has become so popular. I absolutely love that they are built into the wall too. This is an amazing use of such a miniscule space. The shelves are a wonderful idea too: I absolutely hate getting out of a warm bed to go in search of the next book in a series. I would be much happier if all I had to do was reach above my head! I‘m quite fond of the colour they painted this one. I have a shelving/drawers unit that we use as a changing station in a pretty similar shade. This might be one of my favourite designs for a young boys room. Of course you *could* always just use a cupboard if you were really stuck. Very Harry Potter. When we first moved into our current home it was…disgusting; for want of a nicer term. We had to spend a huge amount of time and a fair sum of money to make it livable, but there was just nothing left to put into the bathroom. The best we could do at the time was to rip up the filthy lino and splash a coat of bathroom paint over every suitable surface! Ever since then we have been putting up with what we lovingly refer to as “The Singing Toilet”. Every time you flushed the toilet the whole system would vibrate so violently that it could be heard throughout the building and made any crockery drying in the kitchen fall over. I have lost many a pretty side plate to The Singing Toilet. We had started referring to him with the same level of awe and fear that Gaston Leroux used for The Opera Ghost in “The Phantom of The Opera”. 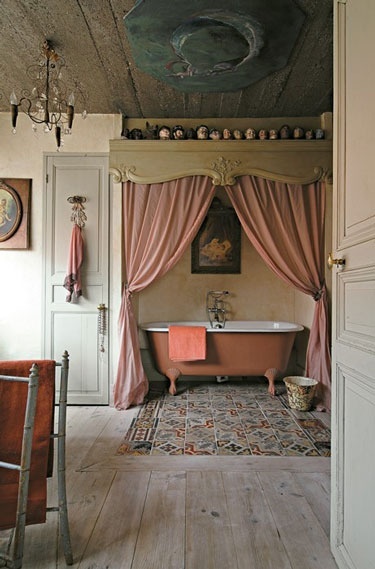 Wonderful quality to have in a baddy from a French classic; not so great when it lives in your bathroom! 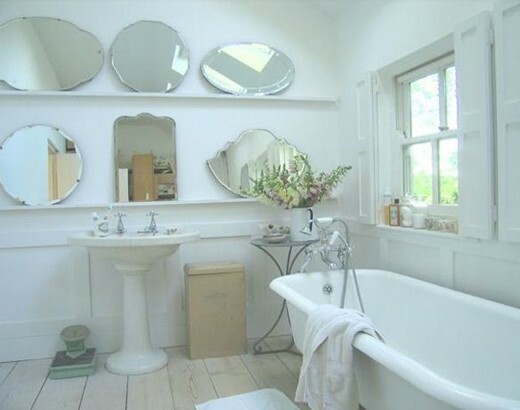 In the time that has passed we have managed to buy a lovely roll top bath; a beautiful sink/toilet set at an unbelievable price (the company went under a few months later so it turns out that, no, you can’t sell bathroom suits at that price and make a profit!) 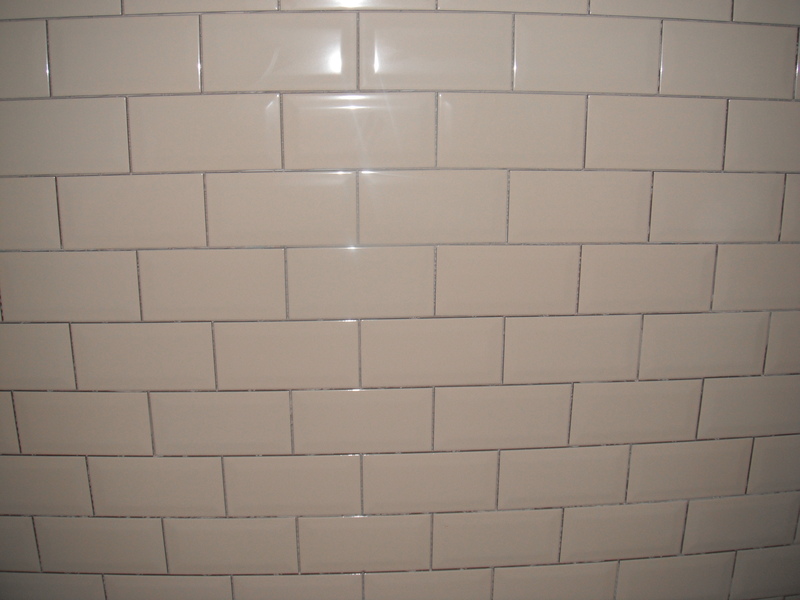 and some rather lovely cream subway tiles. 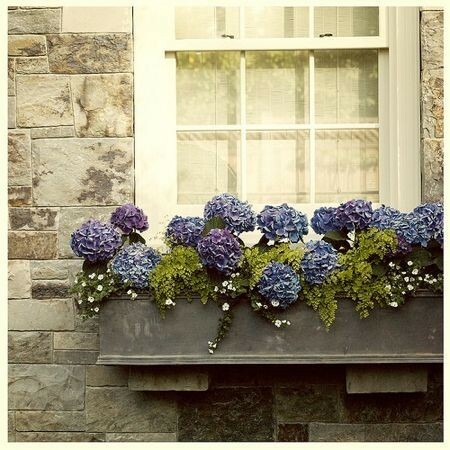 There is a special place in my heart reserved for subway tiles: it’s right next to where the hydrangeas and vintage eiderdowns live. So we had *most* of the things we needed when my Dad offered to pay for the work to be carried out. Not one to look a gift horse in the mouth I accepted and the workmen descended on our home this past week. Here is a sneak peek of the first bit of tiling! Hopefully I will have more to show you all next week. 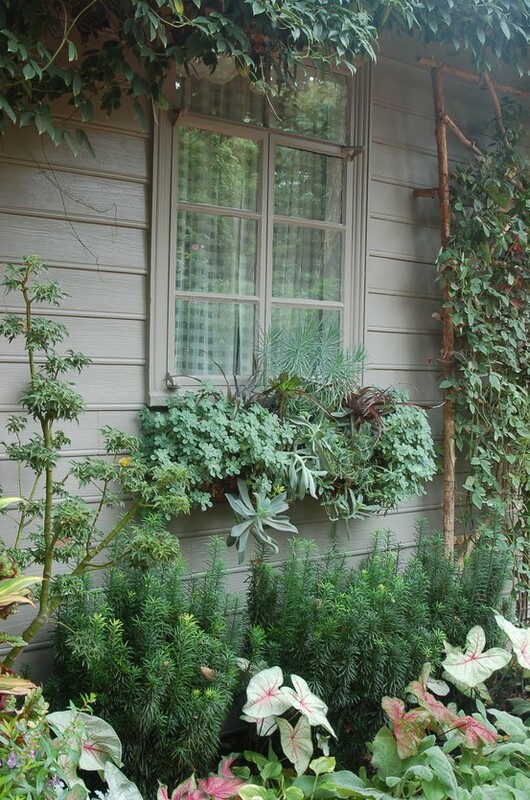 To Window Box or Not To Window Box…That Is The Question! 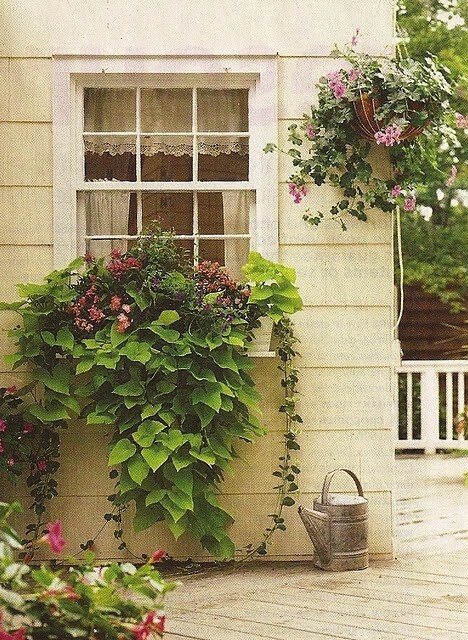 Personally I love window boxes, but would they suit the house? I worry that it’s not a feminine enough style of building to get away with them. 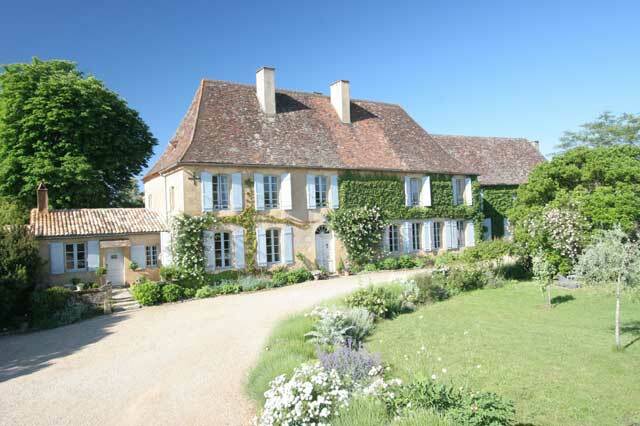 Although I suppose there’s nothing wrong with prettying up the exterior! I’m not particularly green fingered (ok massive understatement: I can’t even keep house plants alive), but I’m sure someone out there must be able to give me some tips. 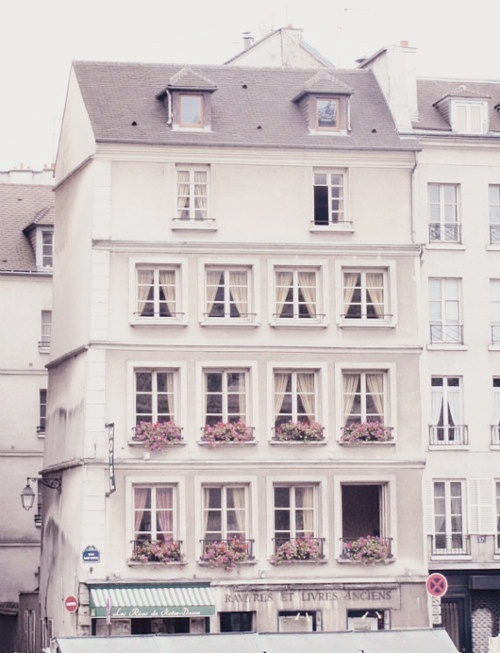 Anyway here are some examples of window boxes I like and I thought you guys could let me know what you think would work. Plants that don’t flower would survive me better wouldn’t they? Or at least not look so bad when they started to die! Now I could happily stare at that picture all day, but maybe the deep red flowers wouldn’t look as lovely against the grey stone as they do against the red brick. 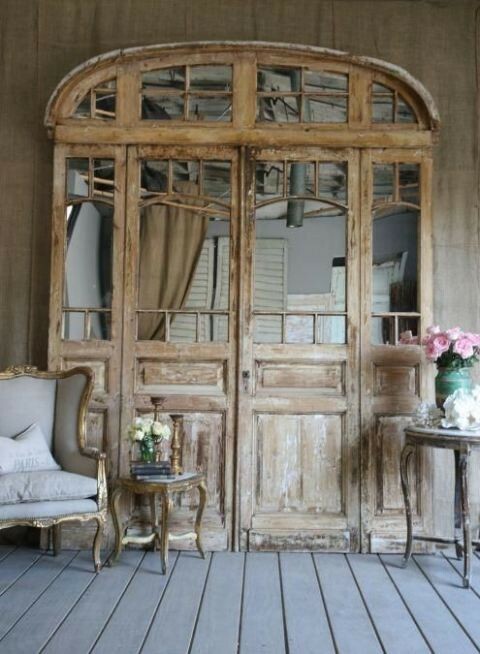 That photo gives me major window envy! 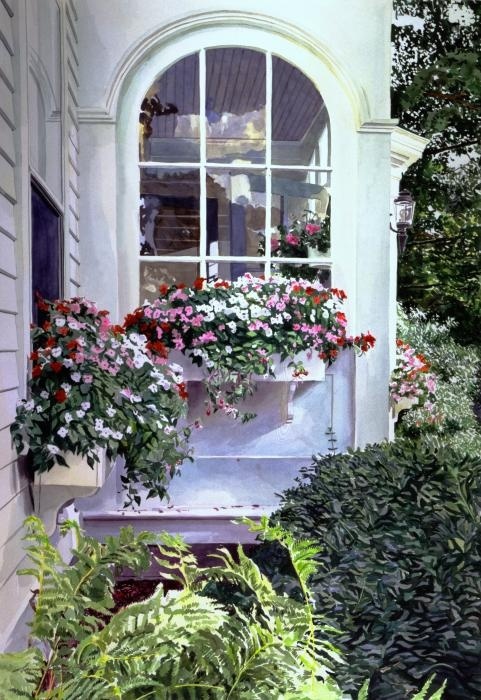 The actual window boxes are beautiful too, but would white work? Maybe if I cleaned up the stonework first. 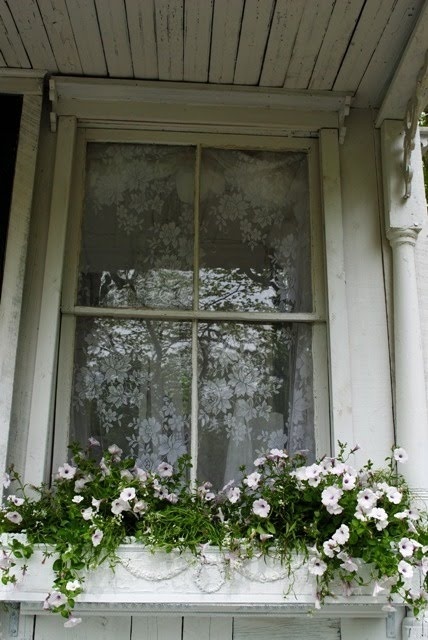 I believe this pretty window box is actually owned by the lovely lady who writes http://myshabbystreamsidestudio.blogspot.co.uk/ . If you haven’t already done so I would definitely recommend checking out her blog: it is absolutely fabulous! I love the foliage in this one. Especially those beautiful bright green leaves. Is that some type of ivy? Now this one I think could be a winner! Can anyone identify all the plants in this? The box itself is perfect and I have a soft spot in my heart for hydrangeas. Fun fact of the day for you all: hydrangea flowers change colour based on the pH of the soil they are growing in. So what do you think. 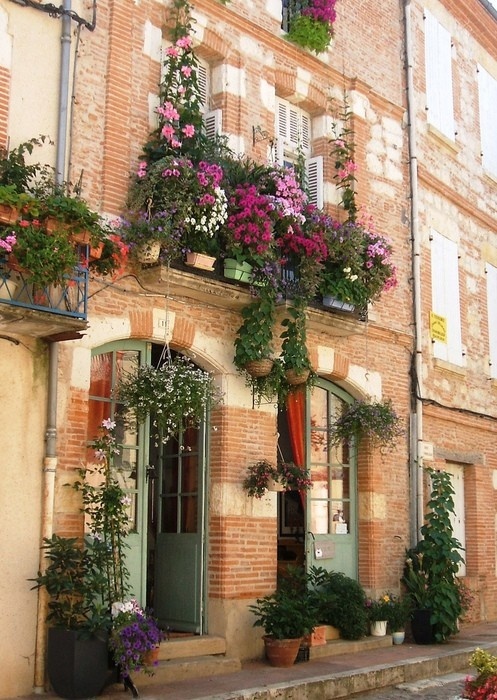 Window boxes. Yay or nay? Now in our current home the idea of buying a big freestanding piece of furniture to house a mere five eiderdowns would be met with laughter from everyone including the cats. Many a time I have had to be rescued from underneath a sudden avalanche of bedding when I have been putting the laundry away – the cats never rescue: they just laugh. What do you think of the colour? 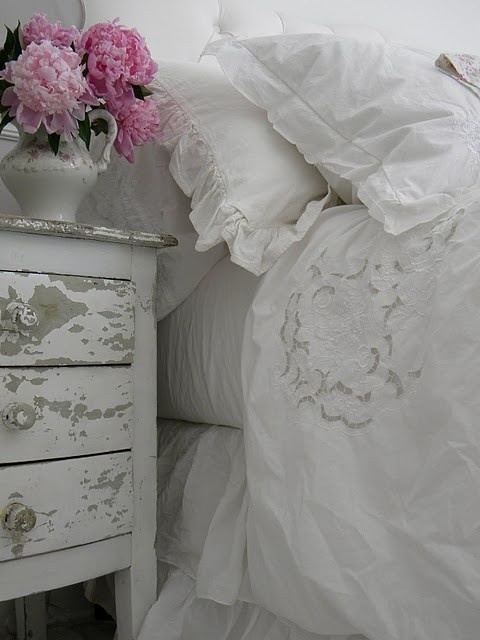 Is it a brave, unique choice or a step too far away from the neutral/white colour schemes of the Shabby Chic purists? 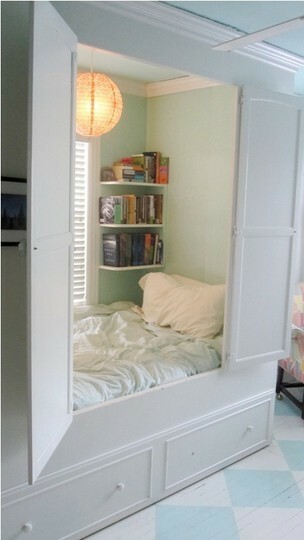 I do love it, but I think I would make it for my daughters room. 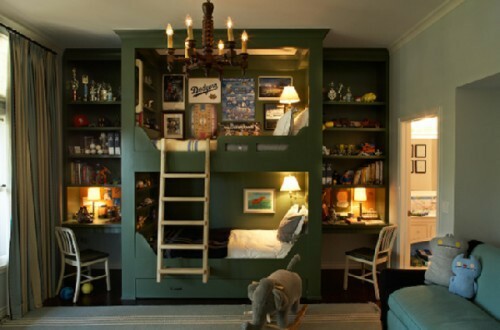 I always have tons of ideas for the childrens room and struggle to decide what to do with ours. We will have to remedy this! We took the plunge and booked the viewing for next week. I know as soon as I get in there I will not be able to let this place go so this could be a totally pointless exercise in torture, but I just cannot help myself. There is something about this place! Speaking to the agent today I found out that they have had surprisingly little interest so I’m hoping maybe if we shift our place fast enough we can swoop in there with a relatively low offer and walk away with our dream home. I just hope we can raise enough money to cover the immediate repairs! I did think about auctioning myself on ebay, but apparently that’s not allowed haha. Any ideas? I’d really appreciate any thoughts you have on unique ways to raise funds. I will be taking *LOTS* of pictures when we are there so stay tuned to see more of my lovely crumbly future home.